As a solo traveler deciding where to have a memorable meal can be challenging at times, especially in Venice. Known for its fabulous art, historical architecture and unique culture, Venice is on most avid traveler's bucket list. The thought of a sunset gondola cruise down the Grand Canal is a potent draw for many people and one of the reasons Venice is jammed packed with tourists during most of the year. 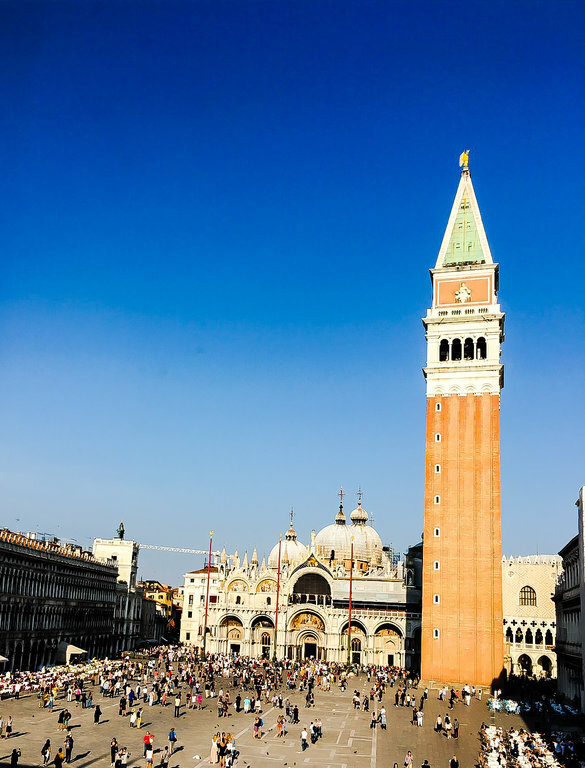 Venice developed into a powerful city-state largely because of its flourishing mercantile trade but in it's modern era tourism has driven its economy. Unfortunately, tourism has not fostered the exceptionalism the city commanded before the twenty-first century. From the proliferation of knock-off Venetian glass and leather goods shops, to the expensive accommodation choices and the mediocre, overpriced food, all of which makes this beautiful city a tourist trap for most solo travelers unless they do extensive pre-trip research and thus, know where to go and not to go to experience the real thing in Venice. Wonderful Italian food is one of the biggest pleasures to be enjoyed when in the land of la dolce vita. Pizza, pasta, prosciutto, cheese, cappuccino and chianti are all most people need to sustain themselves while visiting Italy because these basic food choices are difficult to mess up and they are just downright comfort food to most. The Italians don't demand fancy food but these culinary staples must be prepared with care and eaten slowly with family and/or friends on a daily basis. 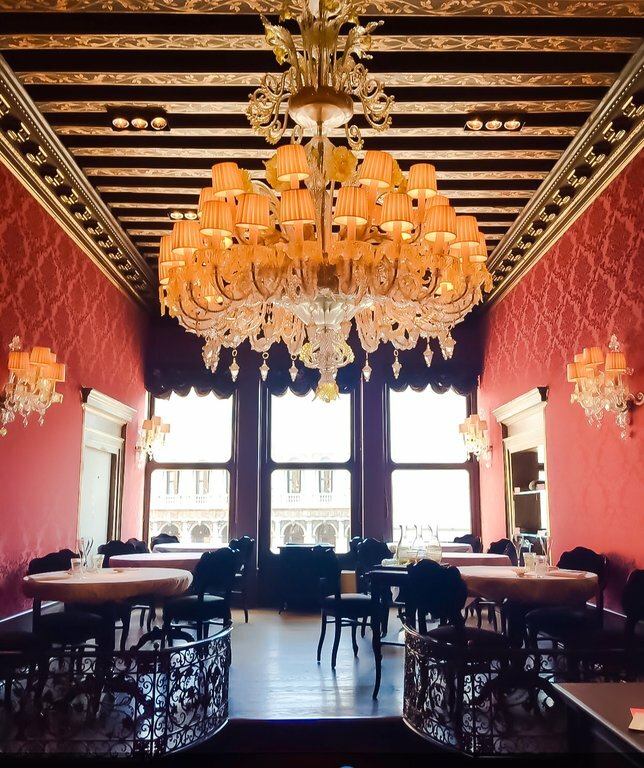 By now I'm sure you are wondering why this long introduction before sharing where to dine in Venice to enjoy an elegant meal. Bottomline, the reason is to prepare you for a SCHOCK! Most restaurant food in Venice is sub-par when compared to other scrumptious, regional Italian foods and it's ridiculously expensive. There are several main reasons for this unique, Italian food phenomenon. Most of the food stuffs have to be shipped into Venice, which is costly, except for seafood which is sold fresh daily at the Rialto Market or by other neighborhood vendors. Consequently, seafood is the favored food in Venice. Another reason is the Venetian restaurateurs cater to the tourist trade creating an environment where the owners are trying to squeeze out the most profit possible from every tourist meal. Many of the restauranteurs are not inclined to worry about serving quality, delicious food because they know these type of clients are one time visitors. The locals eat at home, in neighborhood cicchetti bars or at an osteria for tasty, affordably priced food. Unfortunately, even with my extensive pre-trip, food research, I must admit I fell prey to the worst meal I have ever eaten in Italy at a Venetian restaurant located along the picturesque Grand Canal but I, also, enjoyed one of my most memorable Italian meals at a famed, one Michelin star restaurant, Ristorante Quadri, on St Marks Square. Before I share the details about my memorable meal, I must share a travel tip. Do not eat at any restaurant that has plastic flowers in the planters no matter how wonderful the location is! Now on to the story, I will never forget how bad the pizza was at that Grand Canal side restaurant-of which I can’t remember the name of it was so disappointing- in Venice. I couldn't finish the first slice! Bland and tasteless, I thought to myself, "How could Italians serve horrible pizza in Italy?" To reconfirm my opinion, I asked a group of ladies sitting next to me, who had also not eaten their pizza, if they thought it was inedible? They agreed, "Basta!" Now for my review of the memorable meal I enjoyed at the Ristorante Quadri. 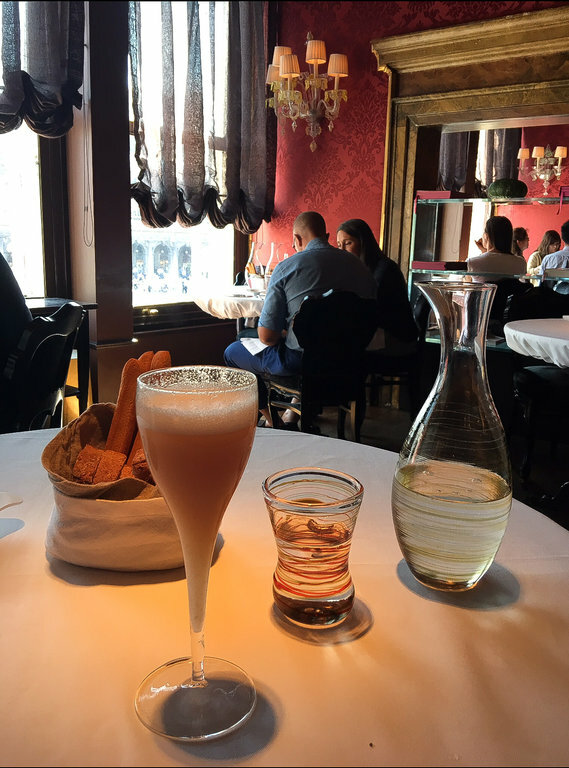 According to Andy Hayler, A Michelin restaurant expert, the Ristorante Quadri is the best fine dining place in Venice that is not to be missed if you want to treat yourself to exquisite, contemporary Venetian cuisine. Conveniently located at St Marks Square, I decided to have my first lunch at this recommended spot. Situated above the popular, Gran Cafe Quadri, it was easy to find. My first impression of the intimate, two room dining area was, "This is what Venetian refinement is all about." From the red damask fabric wall coverings, to the Austrian window shades, the stunning Venetian blown glass chandeliers and wall sconces, the gorgeous, old carved wood ceiling beams, the wrought iron railings, the antique opulent mirrors and furnishings, this was truly an elegant place to enjoy a meal. I was eager to be seated and ready for an exquisite lunch. The meal began with a surprise appetizer served on a wood plank with some of the most wonderful bread sticks wrapped in a cloth basket I had ever eaten, thick, quite tasty and filling. The waiter asked for my drink selection and without hesitation I ordered a classic Bellini, the craft cocktail created by Giusieppi Cipriani, former owner of the famous Harry's Bar. As I sipped this delicious libation and began to relax into the restaurant's elegant environs, I studied the menu. "Ristorante Quadri represents the contemporary expression of traditional Italian and Venetian dishes," is how the renowned Alajmo family of restaurateurs, who currently run the restaurant, describe the cuisine on Ristorante Quadri's website. When studying the menu, I realized it was uniquely organized into three main tasting menus; Classico, Quadri and Tartufo, instead of the standard Appetizer, Main Course, Salad, Sides and Dessert format. The waiter explained I had the option of selecting from one of the tasting menus a two, three, five or eight dish meal. Because it was during lunch and I had already filled up by eating too many breadsticks, I decided to go with the two dish option, a mixed seafood main course and a light dessert. Before my seafood dish arrived, I was served another surprise food course from the chef, a petite serving of beet mousse. With some serious hesitation, I tasted this fancy concoction for palette cleansing. Beets are my "all time, least favorite food!" I couldn't imagine how any cooking magic could make this vegetable tasty. Slowly, I savored this culinary gift and was totally satisfied with the experience because the beet taste was delicately faint and hardly recognizable, all to my delight. Upon ordering my second Bellini, I was ready for the mixed seafood course. Being from Louisiana, an area of the US where its inhabitants routinely indulge in a variety of wonderful seafood cuisines, I was curious as to how a Venetian, upscale seafood dish would compare to what I regularly enjoyed back home. I knew from my pre-trip, food research that the Venetians prided themselves in their highly diverse and exotic seafood specialties. It is an understatement to try and describe my reaction to the seafood medley placed before me. I could hardly make out what I was about to ingest. Blobs of unknown, underwater, crustacean innards each adorned with a different specialty sauce was served to me as a platter of delicacies. The only thing on the plate I could recognize was the shrimp and the squid!! Once again, a bit hesitant to dive in and start eating, slowly, I began to sample each type of mysterious seafood. DELICIOUS!! I was totally amazed how flavorful these weird animals from the sea could be. The rich, carefully prepared sauces accented each sea creature superbly and thus, created a food experience that I would describe as, “a work of culinary art.” The chef's mind that created this unique dish is definitely worthy of Michelin recognition. Without the complicated, interesting sauces and the careful cooking techniques, these seafood varieties would never be consumed by humans but, "Voila," this was a seafood medley for the memory books! After finishing my main course and the second Bellini, I was feeling quite sophisticated that fall afternoon in Venice. Sitting in the refined setting of the Ristorante Quadri, admiring the other diners and their meal choices while chatting with the maitre'd, I felt, "Life was grand!" Being a solo traveler and dining alone most of the time can be challenging but not in this dreamy setting while consuming some of the most refined, creative food in Venice. 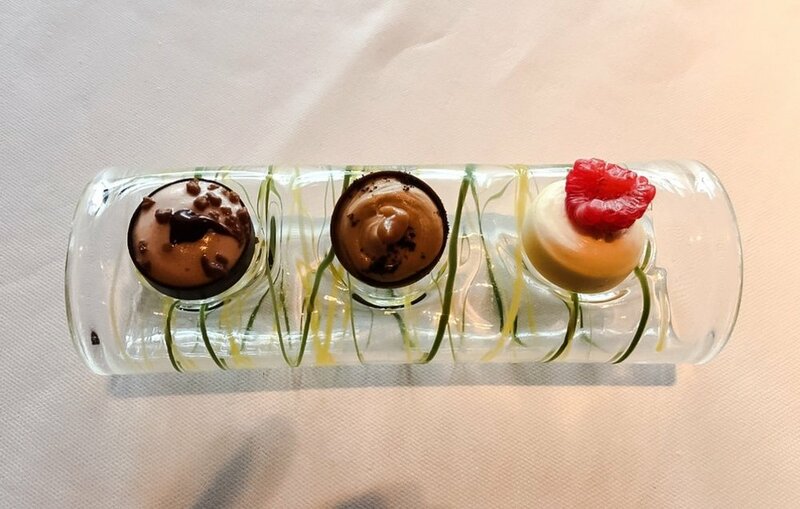 For the final, dessert course, I was served three different selections of mousse in a hand-blown, contemporary dish similar to the other Venetian glass serving pieces that were attractively mixed in with the more traditional white china during this exquisite meal. I paired the sweets with a strong cup of espresso to mitigate the slight buzz I had acquired from the second Bellini. This light, but tasty dessert, was the perfect ending to one of the most memorable meals I had ever eaten as a solo traveler anywhere in the world. One last travel tip, this list of Michelin star eating establishments are quite expensive, as sadly most everything else is in Venice, due to the incredibly large number of tourists visiting this enchanted city throughout the year. Consequently, I suggest you reserve a little more of your spending money for quality dining experiences. Enjoy this short video by Andy Hayler, the well-known food critic, of his three best restaurant choices in Venice. To check flight availability to Venice, click here to check on Expedia.com. One of the best destinations for the solo traveler in Italy is Venice. Pre-trip research and trip budgeting are important travel preparation items for people traveling alone.